My Job is to develop new technologies for adhesives that will be transferred into new products for Henkel. I work as part of a large team on a daily basis to turn new ideas into products on the shelves. The job is vary varied and interesting and constantly changing. You need a good understanding of chemistry for this job, and also to be creative and curious about how things work in order to be able to develop new technology for our products. Good problem solving skills and team work are also good skills to have, as in a multinational company you work with teams from all over the world on projects. Could you describe a typical day for us? My day consists of working in the lab on concepts and ideas. Sometimes we are asked to solve problems with production issues or current products in the market as well as developing brand new products. I go to team meetings with the research, development and management teams to discuss the progress of our current projects. This involves meeting people from different disciplines from production chemists to analytical chemists and packaging engineers. Often I would be asked to conduct health and safety audits in the lab to ensure that the standard of safety and quality is upheld. I can also be asked to attend various training sessions throughout the year. No two days are the same in a research and development environment and it is a very satisfying and rewarding career. What’s cool about your career? I have always loved science, so getting to do what I love every day is great. I am lucky to be in a job that is pure research and development. This means that every day is different and the goalposts are constantly changing. I get to see a product grow from an idea in the lab to a finished product on the shelf. I have learned a great deal not only about science, but about working as part of a team and also about not being afraid to use initiative and take control of my work and my confidence has grown as a result. In Henkel we are rewarded for our hard work and we have a lot of opportunities for promotion. This leads to a long and satisfying career that is yours to make. What are the main challenges in your career so far? Sometimes if we are near a product launch or if there are any production problems there can be a lot of pressure to get the issues solved in a short time frame. All the scientists pull together and get the job done, but it’s worth it in the end. In school I always loved to learn new things and loved science subjects. My science teacher always encouraged me and she made science interesting. My parents always encouraged me to make my own choices for what I wanted to do after school and to go with what made me happy. I chose Biology for my leaving cert and wanted to pursue a career in Biological Science. However when I attended college we did Chemistry, Physics and Biology in the first year and we were to specialise in one for our degree. I knew after a few months that I wanted to pursue Chemistry. I got an honours degree in applied Chemistry. I started my career in Henkel as a Lab Technician and after 12 years I got a promotion to a Research Chemist role. This promotion changed my career path and has opened new doors for me to further my career in Henkel. My job has flexi time and is Monday to Friday. I start early in the morning so I can have a long evening to spend with my family and doing things I like such as the gym and walking. In school along with the core subjects I took Science for Junior Cert and Biology and Geography for the Leaving Cert. These definitely influenced my choice of college course and career as these were my favourite subjects. I attended Our Lady of Mercy Secondary School, Drimnagh where I completed the Leaving Cert. 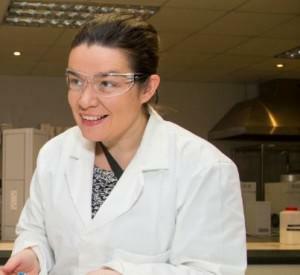 I completed a Degree in Applied Chemistry in I.T Tallaght after which I started in Henkel. The chemistry knowledge is the main thing that I would use daily in my job. A good foundation in basic computer knowledge was also helpful (the use of MS word and Excel in particular). Good communication skills and team work were also relevant, but I have improved these as I have grown in confidence in my job. My job doesn’t involve a use of complex mathematics. I do however use maths every day. I do a lot of formulating which is the process of mixing ingredients to make a final product. Working with percentages and ratios are a big part of this. Normally ingredients for a formulation will be written as a percentage and it’s up to us to work out how much that is in grams or kilograms of the final weight. We work a lot in ppm (parts per million) and again it is up to us to work out how much that is of the final weight. As a chemist we would sometimes have to calculate what is called a molarity and molar ratio which is a measurement calculated by using the molecular weight of the compound that you are using. However, they teach you this in science so don’t worry it’s not that hard! Collecting data after testing is also a big part of my job. All the results will have to be tabulated and the average and standard deviation has to be calculated. Bar graphs and line graphs are used a lot to present our results. Statistical analysis is very important in a science job as it allows us to see trends and to track the progress of our experiments. My job also involves a lot of computer work whereby all the data will go into a computer programme usually excel so all the analysis can be done. I liked maths at school but it wasn’t my favourite subject and sometimes I did struggle. Never giving up and persevering got me through the exams. What advice would you give to a second level student studying maths? There will always be parts of every subject that will test you but there will also be parts of the subject that you will excel in so take the rough with the smooth. If you don’t understand something don’t be afraid to ask to have it explained again to you. Maths is very important for all careers and everyday life so stick with it as you will probably need it. What aspects of the mathematics courses proved most important for your job? The fundamentals like percentages, ratios and fractions are what myself and everyone else would use every day. Statistics are also very important for things like gathering and tabulating data, drawing graphs, computing averages and standard deviation. For studying science at college I found that the algebra and calculus parts of the curriculum were important as these were the foundation of a lot of the scientific maths. If you love science and technology, this is the type of job that you will excel in and be very satisfied in. Do science subjects for the Leaving Cert and focus on getting a science qualification after school. Also work on improving other important skills such as team work and communication. A lot of college courses provide a placement in industry, but if not try to get a part time summer job in the science industry.